The British Council's LearnEnglish Kids' Haunted House is a fun activity you might consider exploring Halloween week with your kids. The activity contains six creepy rooms filled with scary surprises, and kids are tasked to find one item in each room beginning with a certain letter. The clues are presented in a rather unsettling voice, so make sure you preview it and use with "no tears" kind of kids! 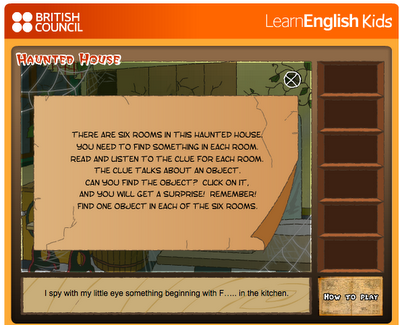 This fun Halloween activity can be used to target semantic skills (rooms in a house, furniture) temporal structures- "When you click on the ____, it _____"- and phonemic cueing. You might also be interested in Carving a Pumpkin!